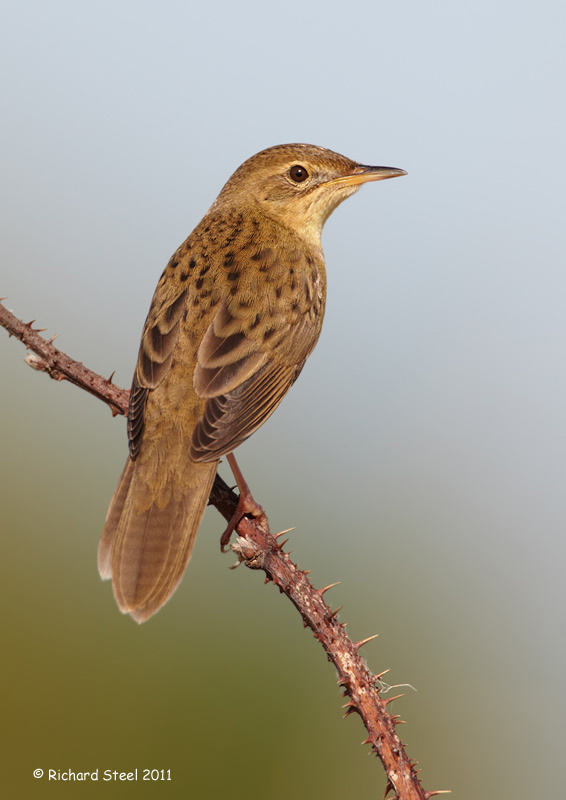 The Grasshopper Warbler or 'Gropper' as they are known locally, tend to arrive on the scrub areas behind the local coast around the third week in April where they take up residence in local bramble bushes. Over the years I have good success with my photography of these birds, that many people have never seen or heard. It is funny business bird photography as you seem to have an affinity for certain species while others you can completely fail to capture a single image. A good example of this for me is the Dotterel that despite numerous attempts I have never managed to put before the camera. 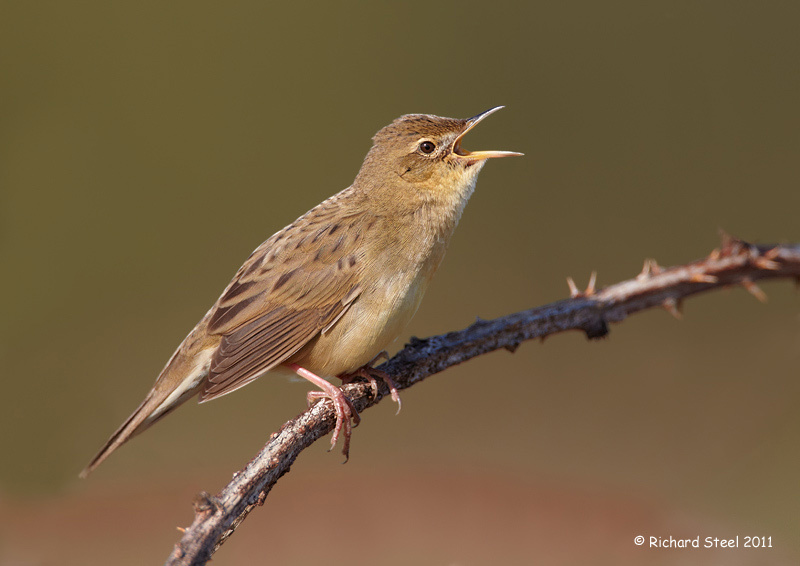 The Grasshopper Warbler derives its name from its insect like song which is also known as 'reeling' as it sound a bit like a fishing reel. 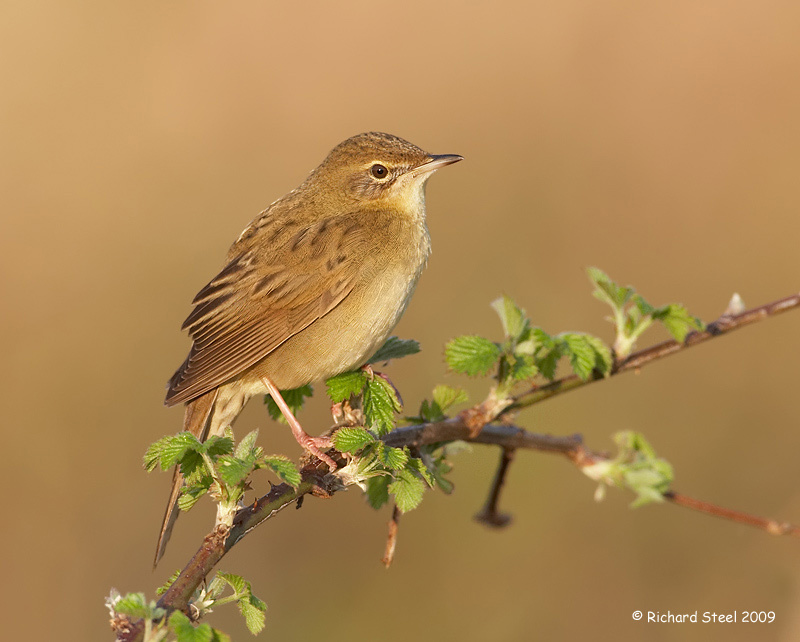 To give you a better impression of these wonderful little birds a video can be seen by clicking this link to You Tube video Singing Gropper . There are a couple of things to note from this video. 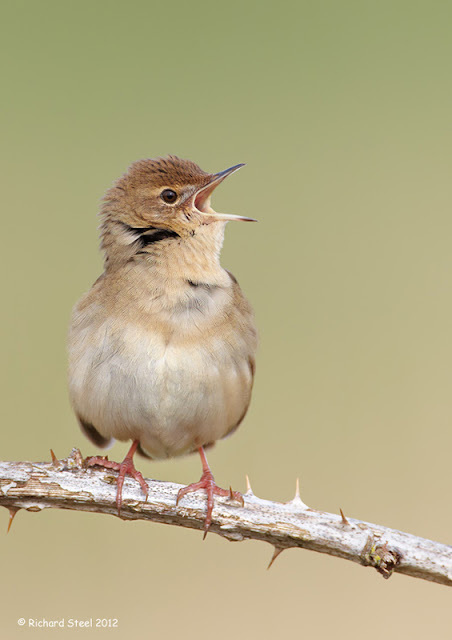 Firstly the bird as it sings rotates its head to broadcast the sound which can make locating the bird quite difficult as it creates a ventriloquist effect and the the song seems to be coming from everywhere. Secondly, to aid the broadcast the bird will often move up to the highest part of the bramble bush. This is the only time you will get a good view of this species as it spends a good deal of time deep in the vegetation. However, this behaviour seems to be limited to a couple of weeks after their first arrival back from Africa and so the window for photographic opportunity is small. An interesting part of the song is that those, how can I put it politely, lets say of more mature years really struggle to hear the song due to the loss of high frequency hearing that comes with old age. I remember a couple of pensioner bird watchers once asking me while photographing these birds if I had seen or heard any. 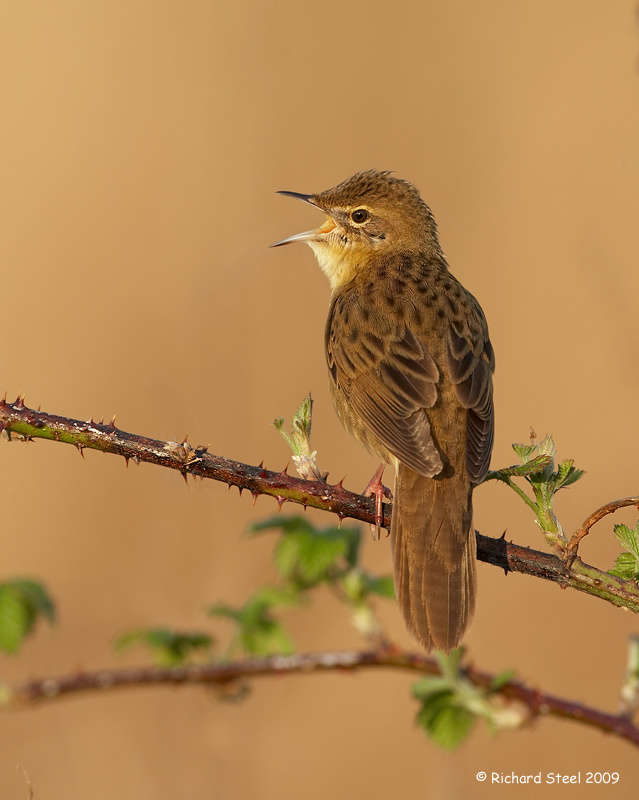 At the time there was one 'reeling' out its song, which to me seems to travel long distances, about 20ft away but they could not hear it at all. I only found out recently that the birds actually come in two colours morphs with the brown type being more common than the yellow version. The difference is subtle though with the yellow just having a more yellow coloured underside. Photographing the birds, as long as you have got the timing right and managed to locate a bird by song, is fairly straight forward. 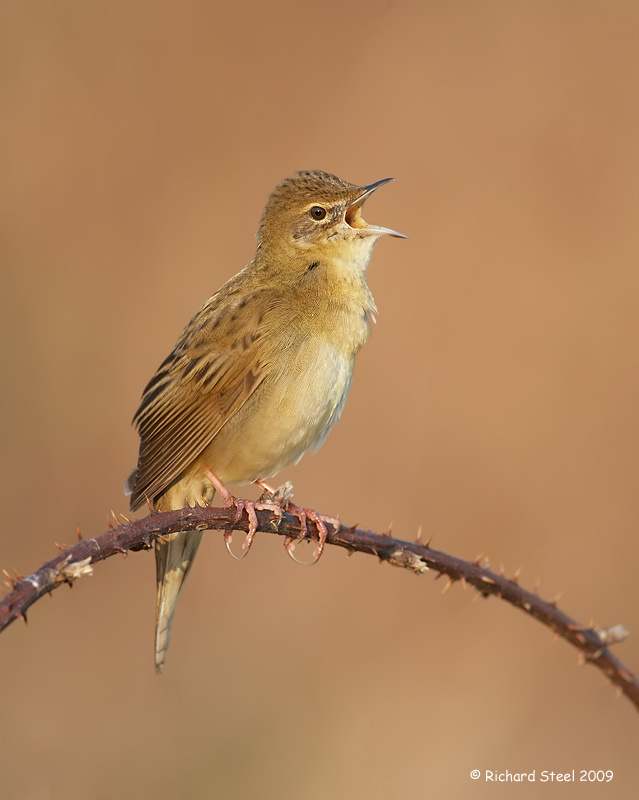 As they are up and singing around the end of April if you hear a grasshopper like sound it is most likely to be one of these birds as it is too early in the year for the insects to be around to cause confusion.It requires a visit at first light and standing next to a bramble patch and before long you can almost guarantee that the bird will make its way to the highest perch to embark on a long bout of singing for several minutes before disappearing back into the vegetation. This process is repeated several times until the sun as got up a little. In this singing mode the Grasshopper Warblers seem fairly oblivious to your presence and there is no need for a hide (blind) but there is a need to keep still or they will quickly skulk back down into the tangle of thorns. When I first started photographing these birds I was a little puzzled why I was getting good detail on the photos in the feathers around the head of the bird but not on the body. It soon dawned on me having spent some time in their presence at very close quarters that the whole body vibrates and quivers as they sing. 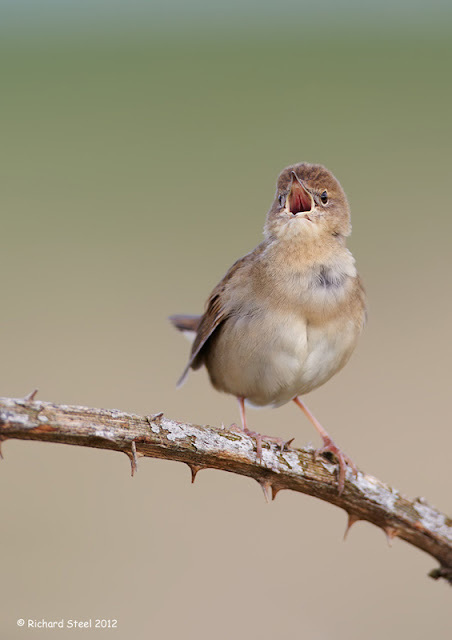 Given that I have built up a good library of images of this bird, each year I promise myself that I will ignore them. However, their song seems to have some sort of hypnotic effect on me and each year I find myself drawn back to them for at least one or two sessions when I should be concentrating on other species, like Dotterel! Every encounter with one of these fascinating birds is a joy and it is always a pleasure and honour to be in their company and to be allowed a brief glimpse into their world. No doubt next year the high tempo clicking will draw me in once more and no doubt will until I am too old to hear it. Wonderful post and photos on a cool bird. Beautiful images Rich. Great to have you back blogging. I hope your health recovery has been strong. Interesting about vibrating body as they sing. I feel bad for birders who lose their hearing as they seem to be missing out on a lot. My turn will come I suppose, unless technology catches up to prevent such hearing loss. Wonderful images Rich. I was thinking about deaf/blind birding just the other day. I guess it's an impediment we must all endure, to some extent, eventually. Amazing captures of a beautiful bird.Thanks for sharing! Wonderful collection of bird photos. Wow,outstanding captures of the cute bird,lovely poses with the beak open! Terrific post and photographs! It's always fun to capture singing birds. Fabulous work, as always!